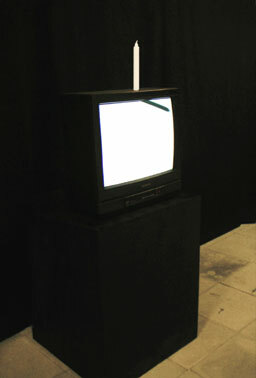 The screen shows a white surface with the shadow of the real candle on the monitor slowly moving into the image from up left, describing a semicircle within exactly 30 minutes and disappearing from the screen again up right. The screen remains empty and white for another half hour, then the shadow of the candle appears again from up left. It takes exactly 60 minutes from the first appearance of the shadow to the second, then another 60 minutes to the next etc.